dances in the recital depending on how many classes are covered in the block. If you have specific questions about combo classes please ask Ms. Becky! Ballet training is essential to a dancer’s progress. It teaches and improves coordination, flexibility and musicality. It also helps develop and strengthen the muscles. Ballet class consists of barre and center work. Ballet classes are offered for ages 3 to Adult! Technique, musicality, rhythm and coordination are all focused on in tap class. Students are introduced to tap steps ranging from beginning to the most complex, and apply the learned material during a warm up, center floor and combinations. Tap is offered to ages 3 through Adult. A Jazz warm up, progressions across the floor and combinations ranging from the most technical to stylized are introduced. Jazz fuses together technique and style, with a focus on stage presence. 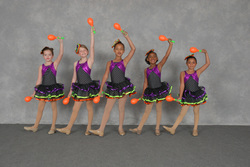 Jazz classes are offered at the studio beginning at age 6 through Adult. One of the most popular dance forms today…Hip Hop is street dancing that incorporates the breakdown of dance moves, which are then put into fun and fast paced combinations. Hip Hop teaches and improves rhythm and coordination. Classes are offered beginning at age 6 through Adult. 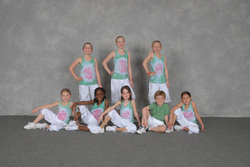 In our younger classes we combine hip hop with tumbling as well. A great fun class that combines two of the kids favorite classes! extremely technical and emphasizes the importance of fluidity in dance. Lyrical classes are offered beginning at age 9 through Teen. Pointe is offered to advanced ballet students who are at least 12 years of age. Students must be pre-approved to sign up for pointe by Ms. Becky. New to Ms. V's this year we will be offering ZUMBA® fitness classes for adults and kids! 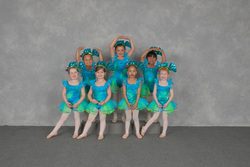 The kids class will consist of learning a recital routine and performing in our year end recital. Adult classes are a fun way to exercise and dance without really feeling like you are exercising at all! Class for adults are drop in or pay for the session and save! We offer both Power and Slow Flow yoga. Power yoga takes you through poses and movements more quickly. Flow flow yoga focuses on breathing and meditation. Our belly dancing classes are 4 week sessions to work on your dancing with a fun new workout. Ms.Becky is an experienced in pageantry and can train your beauty queen to become the reigning title winner. Please contact Becky directly for private lessons. Competition class information will be passed out the first month of classes and will have auditions in October. Competition is a fun way to take your dance training to a new level. Private lessons can be taken with any teacher in any kind of dance and competed throughout the year. Please contact us for schedule availability. Want to have your wedding party learn Thriller to perform at the reception or have a fun entrance walking down the aisle? We can choreograph and teach your party any kind of dance you have in mind! Contact us for available times and information.